Ancient barley helps scientists create ancient beer. Science may not have delivered on some of its promises; Flying cars, jet packs, immortality, etc; but it has done the next best thing - It's given us extra-long life beer. Researchers at Australia's University of Adelaide have cultivated a new type of barley which, thanks to a genetic defect, will keep beer fresher for longer. 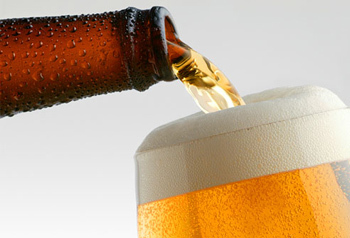 Essentially, the barley used in traditional beer brewing contains an enzyme by the name of "lipoxygenase." The enzyme helps produce several substances, including "trans-2-nonenal," which is what gives old beer that "moldy" taste and old-man's-armpit smell if its left for too long. What Doctor Jason Eglington, of the university's School of Agriculture, discovered, is that some ancient strains of barley come with a defective version of the enzyme. With a little bit of selective breeding, the university's researchers have produced a new strain of barley that lacks working lipoxygenase and is perfectly suitable for brewing. Science, ladies and gentlemen. The Japanese beer barons at Sapporo have already shown an interest in the new barley, dubbed "Southern Star," and are apparently looking to acquire the first crop. Now, what any self-respecting ale-head will tell you is that strong beers already age very well. This new barley is really only relevant to the flavorless goat pee that makes up the vast majority of successful canned beers. To wit; This new barley probably won't make Foster's taste any better, but at least it can't make it any worse.